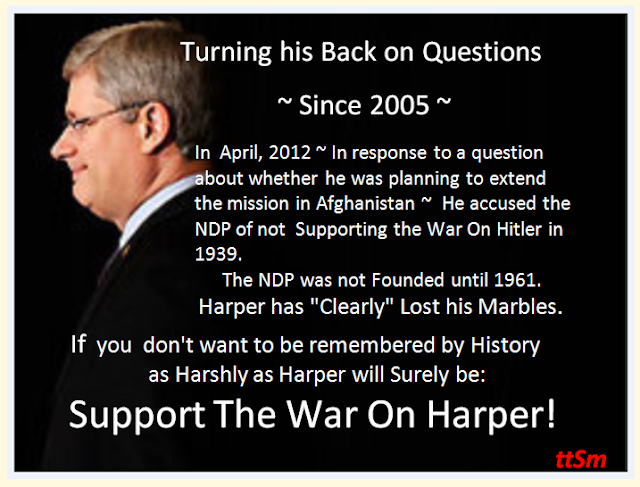 IN the last couple of days has Harper crossed the line. In his insane rant/answer to a question of urgent import on his plans for Afghanistan, He was asked directly if he would be extending the deployment past 2014. Watch the Video. He is losing it. "the NDP, ....the NDP, .....the leader the NDP .. in 1939, did not even want to support War against Hitler! ...... "
on Friday the 27 April, 2012. I am searching for the video. That is a cool pic kim! I stole it, I see that it is signed lol! I'm trying to find the minutes of the 18th parliament to see the conservitive's stance, and how the beginning of the war at the end of 1939 affected party stances. I'll make sure to send you a shout once I compile the goodies. I'm very sure the CCF weren't alone in thinking Hitler was a lot more benign than he actually was. At any rate, now that he's ruled actions in 1939 are fair game, we can start talking about those much-more recent Reform policies, in which he was instrumental. I love this site 1st time here.